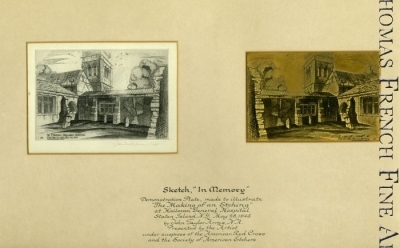 Title: In Memory-Halloran Hospital, Staten Island (In Memory, England) "The Making of an Etching"
Dimensions: Etching: 4 x 6" Plate: 4 x 6" Frame size with mounted presentation and inscription: 15 x 23"
Signature: Etching signed in pencil; Etching plate gold electro plated and inked to show detail. Both example presented in a presentation mount, with a lengthy ink inscription by the artist on the mount. Note: Presented by the Artist, under the auspices of the American Red Cross, and the Society of American Etchers. Framed in original matting, with appropriate aging.